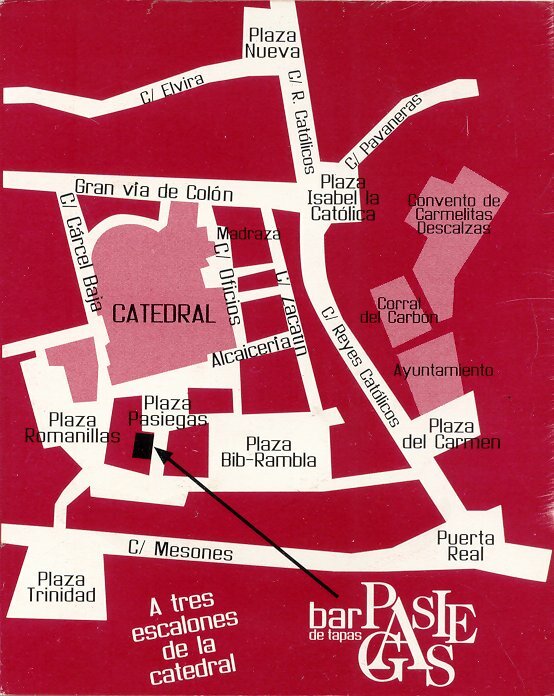 The Tapas-trophic Ishikawas discovered a wonderful, upscale bar called Pasie Gas and dine on and off its english menu waiting for Granada's English bookstore to open after the siesta that shuts down Spain, except for bars, thankfully. Granada has a large university population, and thus, a bookstore where you can buy books in English, The Metro. Cat bought James Michener's old book Iberia, which is great if you want to get in your time machine and explore Spain 40 years ago. The poverty Michener describes has dissappeared, at least as far as the Ishikawas could see. There are more beggars in North Vancouver than in all of Spain that the Ishikawas saw in 3 weeks. Still, a great read. Right next to the Ishikawa's hotel, a fine restaurant, Jardines Alberto featured sword fish medalions that were as good as the orange squid the Ishikawas had been blown away by at Lobs in Florence. Bilberry cheese case was also delicious, whatever bilberrys are. Great food was also to be had at their hotel, Guadalupe: the gilthead seabream is not to be missed, although Cat didn't enjoy the waitress spilling his glass of wine over the tablecloth. At least she didn't pretend they didn't have wine.